Faith Formation Grows to Over 500 Youth: How could we not start off our faith enrichment high-points without illustrating that we now have over 500 youth in our Faith Formation Program? Some of you may remember Faith Formation as “Sunday School” or “CCD”. Faith Formation is our weekly persistent religious education program. It is much more than purely education, however, as Natalie Campbell and her team have enhanced these moments of faith encounter with prayerful moments, opportunities for the families to become involved together, and expansion of post-Confirmation programs. The Adult Faith Formation program, led by Jack Kindsvater, has also expanded significantly this year, with a spectrum of programs to grow our Parish Family’s understanding and engagement with our faith. We are building the future of the church with our youth and shoring up the foundation of every age’s faith formation. SJE Sends Delegation to Convocation of Catholic Leaders: Perhaps the most important moment of 2017 for the US Catholic Church occurred in July in Orlando with the Convocation of Catholic Leaders. This program was created by the US Conference of Catholic Bishops to “form leaders who will be equipped and re-energized to share the Gospel as missionary disciples” (http://www.usccb.org/issues-and-action/get-involved/meetings-and-events/convocation-2017/index.cfm ). What did it mean to St. John? 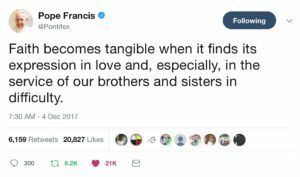 It completely confirmed the Mission focus of our Parish Family, with our outward efforts to spread the love and joy of our faith through our actions. It also showcased that our efforts to develop fellowship for all ages and all the members of the larger Naples community with CYO, CAO, and the Life Center, are directly in-line with the leadership of the Catholic Church, all the way up to Pope Francis. Arts and Music Programs Begins at SJE: It has been part of Father John’s vision since he began the transformation of our Parish Family. The Catholic Church has been the largest patron of the arts for centuries. We cannot allow the beauty of music and the fine arts to be lost, both for the youth and the adult communities. 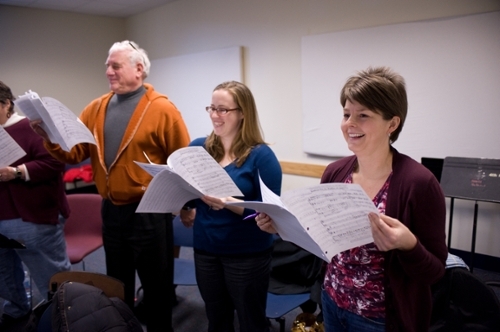 CYO music instruction, including group piano, painting, violin, and voice programs provide inexpensive and inclusive opportunities for children to learn an instrument or how to use watercolors to express their emotions and their creativity. 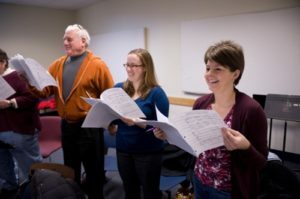 CAO dancing, art appreciation, singing, and guitar classes have opened up the world of the arts to our adults as well, from an Improv Class for our Young Adults to ballroom dancing for all. This also includes concerts, plays, and other opportunities for our Parish Family to experience and appreciate the splendor of the arts together. Construction Kicks into High Gear: I had commented on the “Tale of Two Campuses” after Hurricane Irma, referencing the active building project of the Pulte Family Life Center and the rest of our campus, which is heavily damaged by the storm. Well, the past weeks have showcased just how much can be accomplished with determination and dedication. 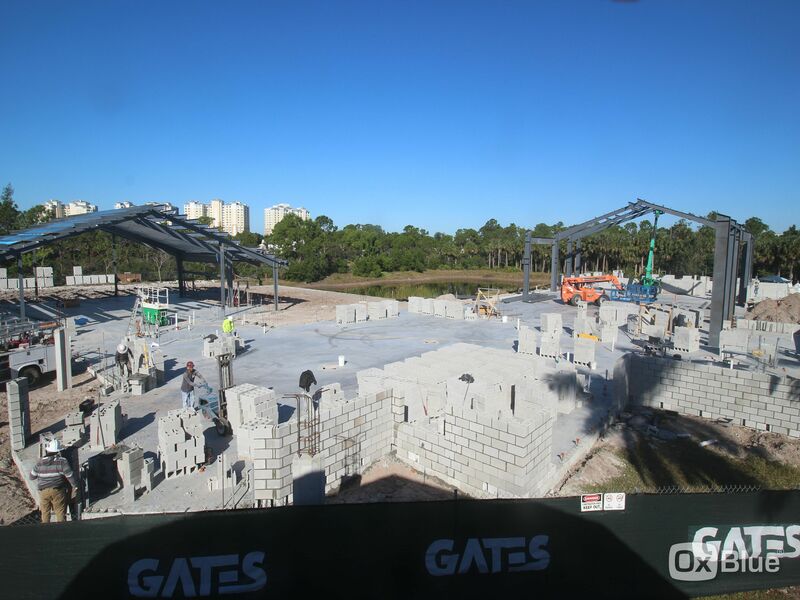 Not only has the Life Center begun to take shape, with the frames springing forth from the ground, but critical steps for our church and other facilities have begun. The skylight has been removed from the church roof before it caused more leaks. Our Bell Tower has been removed to ensure the safety of all our Parish Family and will be rebuilt with our church renovation efforts. The new Air Conditioning systems have been installed in the church, hopefully making Christmas comfortable for all that attended. Progress is being made on all fronts to get us to our repaired, renewed, and reinvigorated campus. 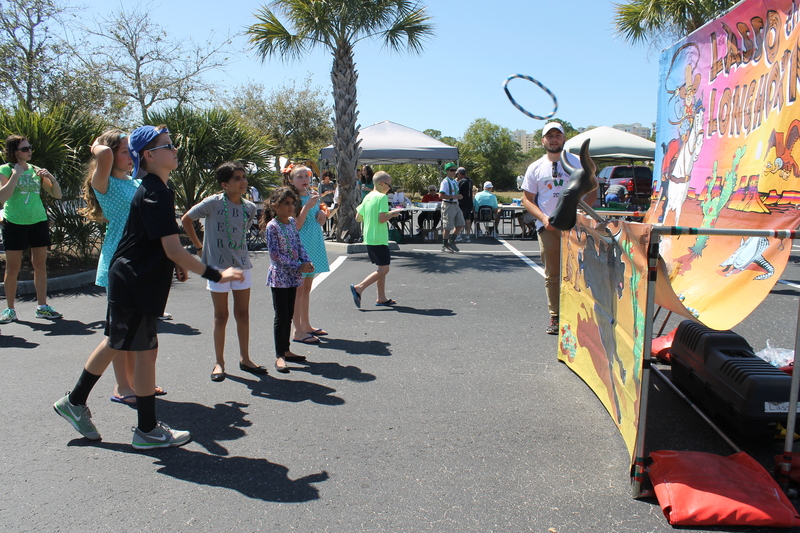 Gaelic and Garlic Festival Celebrates Saints and Packs 2600 People Into SJE: Over 150 volunteers of our Parish Family supported the first ever Gaelic and Garlic Festival, a two-day Irish and Italian cultural festival, held between Saint Patrick’s Day and the Saint Joseph Feast. While there were questions about the validity of such an event here at Saint John, there is no doubt that is was a huge success! Over 2600 people from all over the area came to St. John to sample corned beef, pizza, and many different food and drink options. We were serenaded by Broadway Opera Stars and watched the Tir Na Nog Irish Step Dancers high kick around the Ballroom. With the Bishop blessing the groundbreaking of the Life Center and the procession of Saint Joseph after Mass into the celebration, we integrated our faith with our fun festival extravaganza. The smiling faces of the children (and adults) eating cotton candy and funnel cakes through our campus made every second worthwhile. Parish Family Celebrates Father John’s 20th Anniversary of Ordination: We all rejoiced in our Pastor’s, Father John, 20 years of priestly service this year. We have been blessed to have him for over 8 of those years, and it was a true testament to his impact on our community that so many people came to thank him. 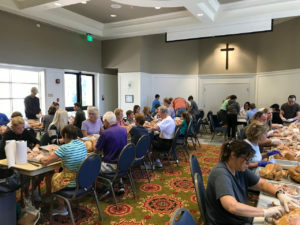 The Knights of Columbus served these 800 hungry people after Mass with a simple picnic of hamburgers and hot dogs (with all the trimmings, including some award-winning chili and homemade coleslaw). 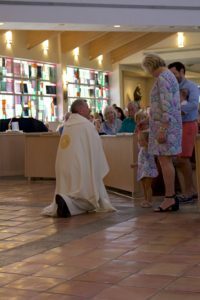 The applause for Father’s Homily rang out in the church as he explained just how important his family was to him, including the vestments he wore both at his anniversary Mass and the day of his ordination that his family had sewn just for him. He then stood for 4 hours straight, greeting and thanking every single person in line, with no breaks. CAO Movie Night – Spotlight: Some things are not comfortable, especially when it comes to looking back at mistakes and completely inexcusable behavior. The Catholic Church scandal that has continued to rock the institution of the Church came to light in Boston, MA. Spotlight is a movie worth watching for mature audiences, especially those of us that truly care that our Church never allow these abuses to occur again within our walls. 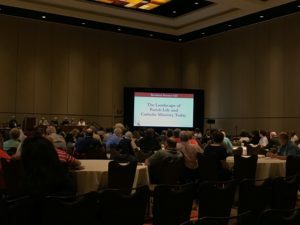 Our Parish Family came together to not only watch this powerful film, but also many attended a listening session with our priests to explain how these events and this scandal has impacted their lives and those of their loved ones. Bee Gees Tribute Night Kicks Off CAO: A packed house, a full dance floor. The Catholic Adult Organization, St. John’s new programmatic focus to provide fellowship for our adult Parish Family members and the community through sports and wellness, arts and music, and social and spiritual activities, kicked off our social events with a brand-new event, Saturday Night Fever! 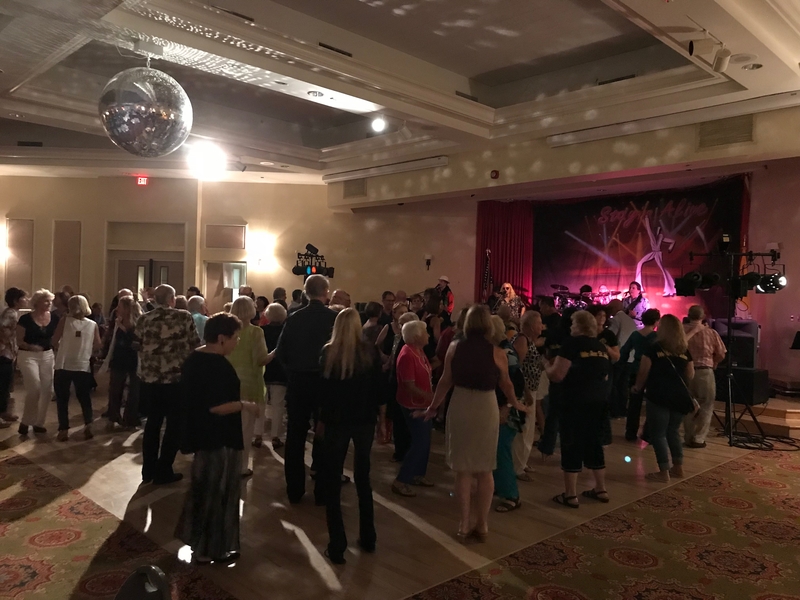 This disco themed party included the largest mirror ball in Southwest Florida, spinning above our dance floor as the Bee Gees Tribute Band, Stayin’ Alive, rocked out with 70’s hits. We created a “VIP” Room for a pre-party, full of fondue and specialty drinks, and individuals were able to gather before the main event, ensuring that no one would feel left out. There were people decked out in their bell bottoms and disco clothes, and they danced the night away. We sold more tickets in two weeks than any other event in recent memory, especially in August, and the room was bursting with over 350 people from all over the area enjoying their evening at St. John. Helping Hands Feeds 40,000 in 1 Hour: Would it be possible to double our efforts from 2016, where we made 20,000 meals in 46 minutes? Our Parish Family responded with an emphatic “YES!” We set up the Ballroom as two full assembly lines to pack special meal packets for Catholic Relief Services, who serve refugee camps around the world. In order to assist us in our Mission focus, Father Donald Doll provided photographs he has taken around the world in assisting the Jesuit Refugee Services. 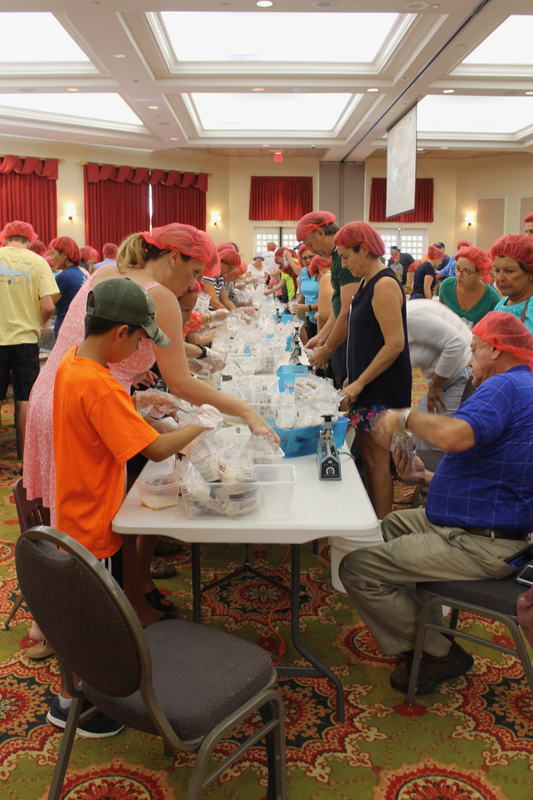 These striking images put a human face to the meals we were making, and with Father John’s rousing opening statement (and red hairnet), well over 300 volunteers got right to work. With all the love and joy that was being spread in the room and everyone working tirelessly, we were able to pack food for 40,000 people in just 1 hour and 3 minutes! The final gong went off and all the volunteers, exhausted from their hard work, cheered and shouted. A final blessing came to us all as New York Pizza and Pasta donated 50 pizzas to our volunteers to feed them after they had fed so many. Parish Family Comes Together to Support Community After Hurricane Irma: There is not a single moment this year that showcases the love, healing, joy, and action of our faith than the two weeks after Hurricane Irma decimated Naples, Immokalee, and the entire Southwest Florida area. Even without power at our church, we continued to gather for Mass and then take action every single day to assist the community. We packed 45 truckloads of donations that were we delivered with our own box truck to Immokalee, East Naples, and even right here in Naples Park. We were a water and ice distribution node for the local community. We delivered diapers to the Guadalupe Center and to the FEMA support center at Saint Peter’s. We went up to St. Leo’s and grabbed pallets of water and food to give out. 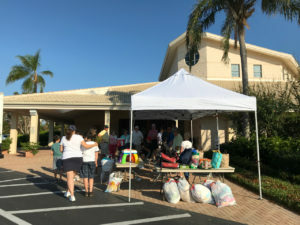 Dozens of volunteers spent their days in the hot sun gathering the wonderful gifts our Parish Family brought to the church and they sorted it all out for the deliveries. In the midst of all the devastation, the laughing and camaraderie, the sweat and the grit, the pure love came through in every face and every hug on our campus. Our Parish Family made a difference. Feeding 1600 People with Thanksgiving in the Park: As if we had not just spent every ounce of energy in September serving the community after the Hurricane, our Parish Family again focused on the action of love by building over 1600 hot meals at the Immokalee Airport Park on Thanksgiving Day. Thanksgiving in the Park was in its 36th year, but this was the first time that St. John took on the entire responsibility to execute it from beginning to end. Our partner, the Guadalupe Center, assisted us with the transition. Donna, my wife, led 375 volunteers over the week of service that supported Thanksgiving in the Park, from gathering turkeys during “Take Your Turkey to Church” Weekend, shredding those 200+ turkeys, and of course serving the meals in Immokalee. Their efforts were seen in the smiles of the children who got a warm meal, a chance to play in the park with our CYO corn-hole and kick-ball games, and enjoy a moment of warmth and love of the community. When we found out that a local community was too afraid to come to the park, we put food into a minivan and drove it to their homes. 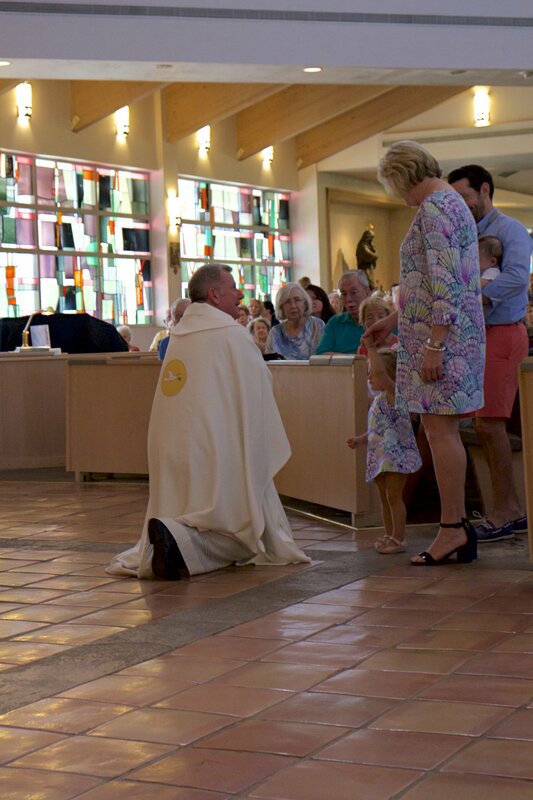 What continues to astonish me in my service to our Parish Family is that these highlights are just singular moments of our community that continuously lives out our mission. Every single day, we have members of our community visiting the sick, comforting the lonely, serving the poor around the world, and enlivening our youth with fun activities. Each and every member of our church should be proud to say “We Are Saint John”. Thank you all for this constant dedication to our mission and our faith. You are truly a blessing.